Rocky Mountain’s 200mm-travel Maiden was put through four years of development, a long time for those riders who were waiting to see what would replace their previous downhill sled, the always dependable but chunky Flatline. The wait culminated in a full carbon fiber frame that sports an up-sized version of the company’s Smoothlink suspension design, adjustable geometry, and the ability to accommodate either 27.5” or 26” wheels. It also happens to look pretty damn sharp, doesn’t it? There are four complete Maidens to pick from, starting at the ”entry level” X-Fusion-sprung Maiden Park for $4,499 USD that actually sounds like a deal when you find out that a Maiden frame and BOS Stoy RaRe shock costs $3,999 USD. It all tops out with the insanity that is the aptly named and Di2-compatible Maiden Unlimited for $10,499 USD. Not prepared to pay five digits for a bike? The $6,999 USD Maiden World Cup that’s reviewed below still comes with BOS suspension that’s bolted to the same carbon fiber frame, but with a less Gucci parts spec used to finish the build. The Maiden offers riders a number of geometry adjustments, as well as the option to run 26″ or 27.5″ wheels, but the bike’s 425mm chainstay length stays the same due to the two axle positions being laid out vertically (to compensate for the change in wheel diameter) rather than horizontally. These two axle positions, along with a spacer that mounts into the underside of the head tube, allow the bike to maintain the same trail and bottom bracket numbers regardless of if 27.5” or 26” wheels have been fitted, something that should make for a consistent handling bike. Riders also have the ability to tune the Maiden’s head angle in 0.25° increments, taking it from 63° – 63.8° in four steps, hence the Ride-4 name for the rotatable chip system employed at the lower shock mount. 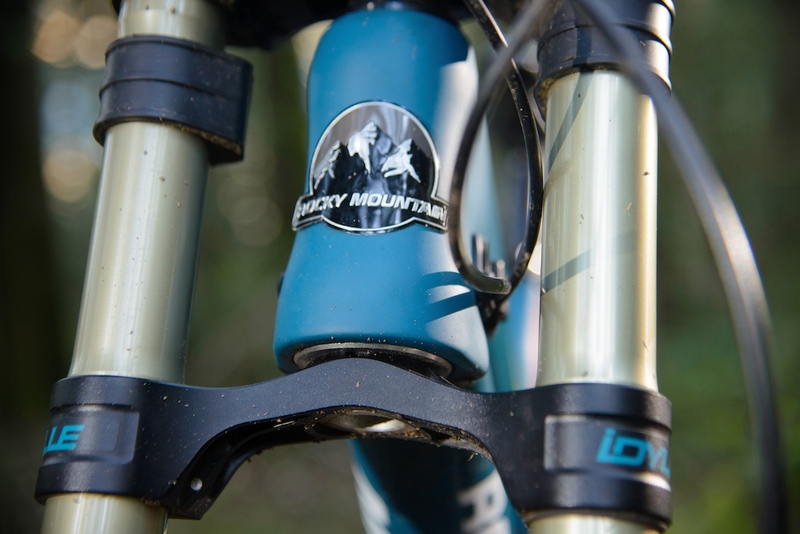 But unlike the more complicated Ride-9 design that Rocky Mountain uses on many of their trail and enduro bikes, Ride-4 only alters the bike’s geometry by changing the head angle and 10mm of bottom bracket drop, not the suspension rate. Again, consistent handling and consistent suspension action across the board was the goal. A number of hefty looking aluminum Maiden prototypes were seen out in the wild during the bike’s development, including the wild ”Smurf Massacre” bike that Geoff Gulevich rode at the Red Bull Rampage back in 2014, as well as the different test bikes that Thomas Vanderham was spotted on. However, these mules were manufactured at Rocky’s North Vancouver facility to dial in the bike’s geometry, suspension, and pivot design, with the production version always going to be made out of carbon fiber. 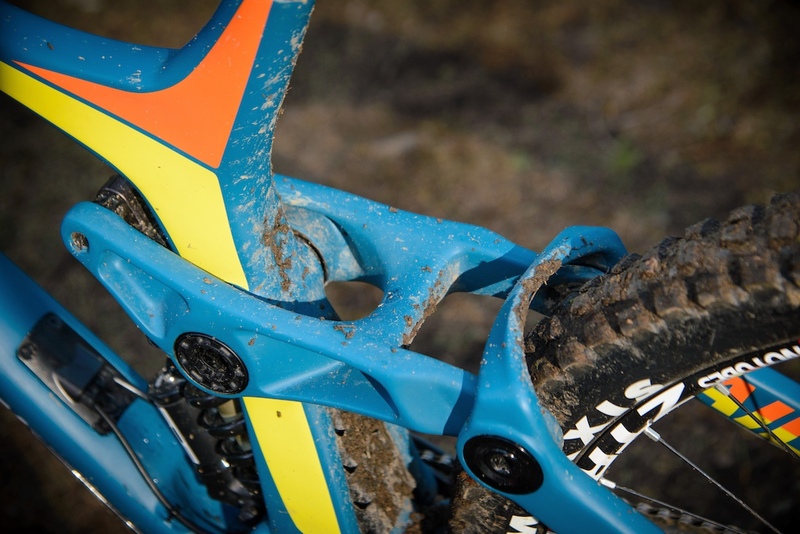 And that’s what Rocky Mountain did, including the massive rocker link and chainstays, two areas that many other companies choose to build out of aluminum due to what they say are cost concerns and relatively minimal weight savings of using carbon fiber. But the Maiden is carbon fiber front to back, constructed via Rocky Mountain’s ”Smoothwall’ method that refers to their use of a rigid mold rather than a bladder during the layup process to ensure that the frame’s shape is consistent both inside and out. The Maiden wins the ‘mine is bigger’ game when it comes to rocker links. Rocky Mountain has long used a bushing-based system for most of their bike’s pivots, now known as the updated ”BC2” system but previously called ”’ABC.” However, the large size of the Maiden’s pivots showed that a bushing system, while extremely flex-free, would have too much inherent friction due to the increased contact surface of the massive pivots, so Rocky ended up going with sealed bearings instead. Ginormous sealed bearings, that is – they’re Enduro MAX bearings that are the same size as what’s used for a BB30 bottom bracket, and it’s all held together by an up-sized version of Rocky’s ”Pipelock” expanding collet hardware. The large bearings and associated hardware no doubt add weight compared to smaller and more commonly used bearings, but Rocky Mountain is clearly aiming for long-term durability rather than out and out weight savings. A Maiden frame, along with a BOS Stoy RaRe shock, is said to weigh in at a not light but likely extremely durable 9.2lbs, and the complete Maiden World Cup weighs in at 36lbs 1oz. Shift and brake lines enter just in front of the fork bumper and exit near the bottom of the downtube. 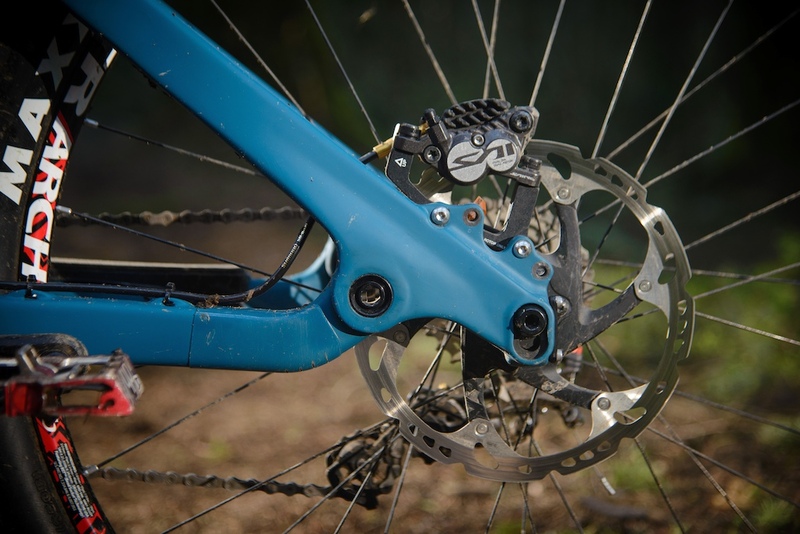 The burly looking frame features captive pivots at the dropouts and main pivot, and a splined cassette tool is required to access both the latter and the rocker link pivots. There are ISCG 05 chain guide tabs around the bottom bracket shell, of course, and the shell itself is actually a downhill oriented PressFit BB107. This system uses press-in cups that end up having the same overall width as external cups in a common 83mm wide shell, and the frame is compatible with any crankset that would fit a bike with an 83mm shell, despite the somewhat confusing BB107 nomenclature. No need to lose your mind over another so-called standard. Out back, the Maiden’s rear hub spacing is 12 x 157mm, and there are actually two different IS brake mounts – one to work with each wheel position. 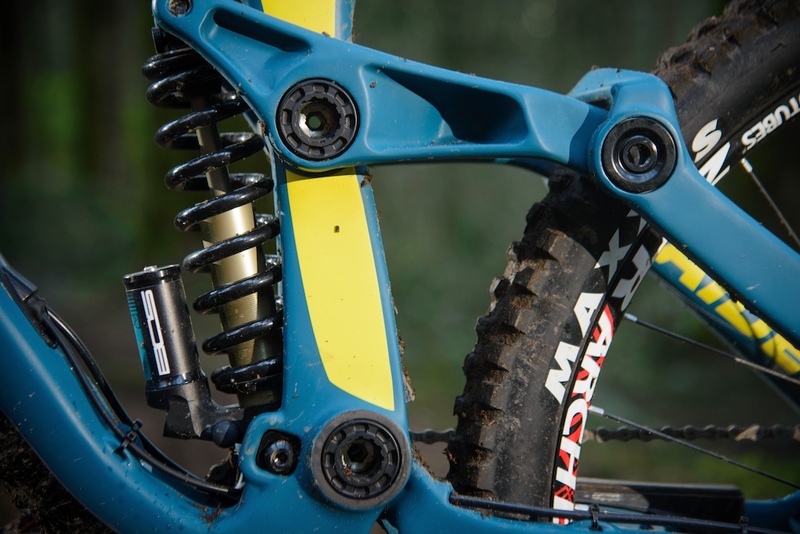 Rocky Mountain has also gone with a bolt-on thru-axle rather than any sort of tool-free setup. Cables are routed inside of the frame, with both the shift and brake lines entering behind the headtube and exiting through a nifty port near the bottom of the downtube, the same port that also provides access to your Shimano Di2 battery should you want to go electric one day. Two axle positions require two brake caliper mountain positions. Like most companies, Rocky Mountain has put a plastic downtube guard to work to keep hard pointy things from doing any terminal damage, and there’s a shark gill-esque plastic shield that is fitted inside of the v-shaped cutout where the carbon frame splits to go around the shock. 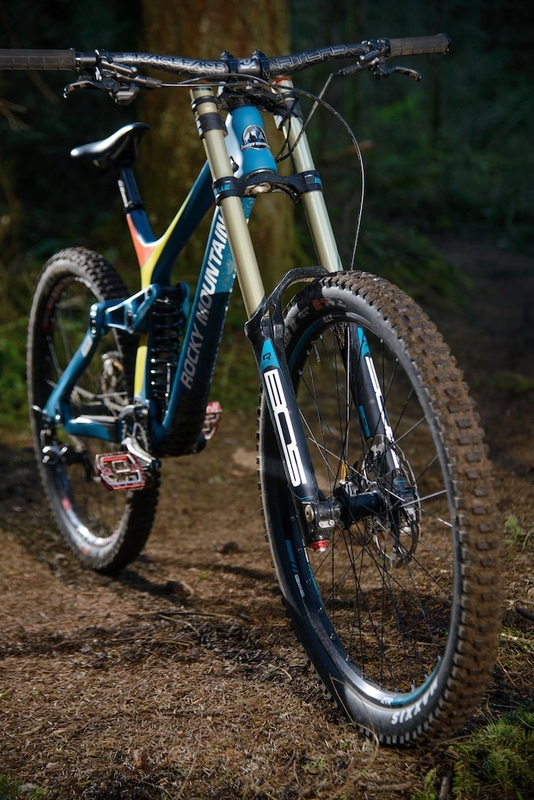 The Maiden’s 200mm of rear wheel travel is controlled by Rocky Mountain’s Smoothlink suspension design. It’s no surprise that this design is also put to work on the 200mm-travel Maiden rather than the Flatline’s simpler linkage-driven, single pivot setup. Rocky says that the system has been tuned for the Maiden’s rowdy intentions and much longer travel, with a progressive stroke that they claim splits the difference between a flatter, more linear system and one that ramps up too quickly to allow riders to use all of the bike’s travel when needed. This could be noteworthy given that the stock bikes all come with a coil-sprung shock that doesn’t allow for easy ramp-up tuning like an air-sprung unit would by using volume spacers. 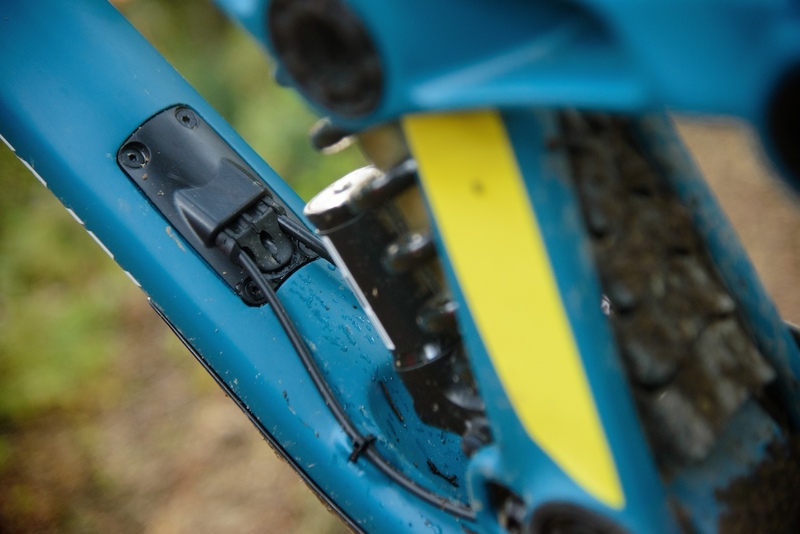 The lower shock mount is home to a four-way adjustable chip that can be used to tune the bike’s handling without altering how the suspension feels. 3 Questions With the Ken Perras, Rocky Mountain Product ManagerMike Levy: Rocky Mountain stated that the Maiden hasn’t been designed as only a pure downhill race rig, but also a bike that’s fun to ride in the bike park. What sort of things were done to make this so? Ken Perras: There are three key design features that come to mind that makes the Maiden a good choice for bike park riding. We have adjustable geometry with our Ride-4 chip. This gives the Maiden one-degree of adjustability in the head tube and 10mm in bottom bracket drop, and greatly affects how lively and responsive you want it to feel. We offer the ability to build the Maiden in either 26” or 27.5” wheel sizes with our two wheel positions in the seat stay and the headset cup that installs in the bottom of the headtube. These two adjustments keep the exact same geometry between both wheel sizes, so there is no compromise in handling. Many riders still prefer 26” wheels for their strength and ease of moving the bike around. The last point is durability, which is covered below. Levy: Most people think of low weight when they see a full carbon fiber frame but, at 9.2lbs (with a shock), the Maiden isn’t exactly svelte. Would it be fair to say that weight wasn’t at the top of your priority list when designing the Maiden? Perras: The top priority for us, as the Maiden is our first full carbon downhill bike, was to build a strong and reliable frame. We have a world-class roster of DH and freeride athletes at Rocky Mountain, such as Wade Simmons, Geoff Gulevich, Thomas Vanderham, Remi Gauvin, and Vaea Verbeeck, racing World Cups, competing in Rampage, and generally rallying their bikes all over the globe. We know what these guys do with their bikes so we chose to go with a design that won’t let them and our paying customers down when it comes time to ride. We have the experience in carbon design and manufacturing, but we didn’t want to skimp on the pivot points. We use very large and high-quality black oxide Enduro MAX bearings at all pivots. We use large diameter pivot hardware. In the two pivots that see the majority of the loads (lower and upper main pivots), we use our Pipelock axles that lock the hardware to the frame, creating a very rigid and robust pivot system. Big bearings require big pivot hardware. Levy: A lot of riders probably consider BOS suspension to be quite exotic, especially those in North America. Why did Rocky go with BOS instead of Fox or RockShox for all of the builds except the X-Fusion-sprung Maiden Park? Perras: The reason for the BOS spec was simple; they have a long history of building high-end suspension products that have proven themselves over many championships. The simple tooled adjusters required a more focused approach to unlocking the high-tech performance of their forks and shocks, of which they deliver in spades. Additionally, the one-year oil change and two-year full-service intervals mean more time to ride. As exotic as BOS might seem, they have made great strides in becoming more accessible to the general consumer by partnering up with more service centers. For North America, as an example, there is Suspensionwerx in Vancouver, BC, S4 suspension in St-Jerome, QC, and QBP in the USA. 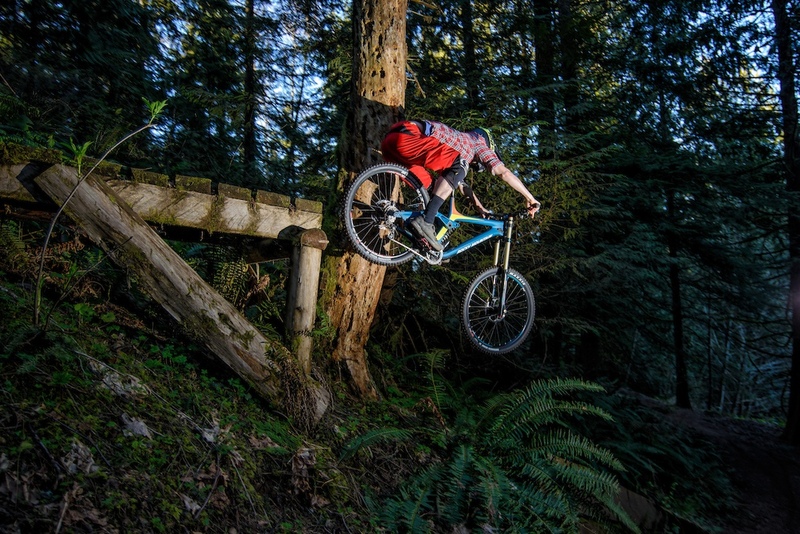 It can take a lot of work to feel like you’re getting the most out of a relatively tame trail when riding a downhill bike. So many are only about beeps, course tape, and the straightest line possible, which is all well and good if you live and die for zip-tying a number plate onto your handlebar on Sunday mornings. Take away the clock and the pressure, and you’re left with a bike that might be easy to ride fast, but that’s also about as playful as a sloth on Xanax. 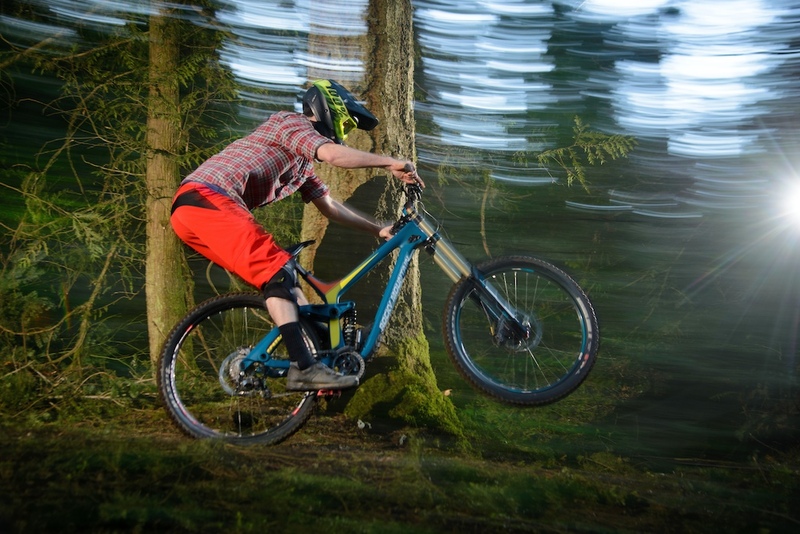 Yes, I know that pure downhill race bikes are a lot of fun, and I know that you can jump and send it over anything you want when you’re on yours, but I also know that there’s a big difference in handling between a bike made purely to race the clock and one that’s also down for a bit a fun. The Maiden is very much down for some fun. The Maiden is a natural jumper, which quickly led to some airborne antics. While Rocky Mountain’s new downhill bike may not have that all-out aggressive feel to it, it most certainly makes the most of terrain that other bikes of similar travel would probably just gloss over. The Maiden is easy to pick up and place, which makes it great at sudden line changes, be it to cross over the trail to hit an otherwise hard to reach lip, or maybe to come through the inside of a corner that a less accepting DH rig would prefer to stay to the outside of. This makes the Maiden a hell of a lot of fun on a trail with multiple line options to choose from, especially if said trail is full of sneaky insides or littered with lips, places where it makes bikes like the V10 or Supreme DH V4 feel like they have double pinch flats and are missing their chains. 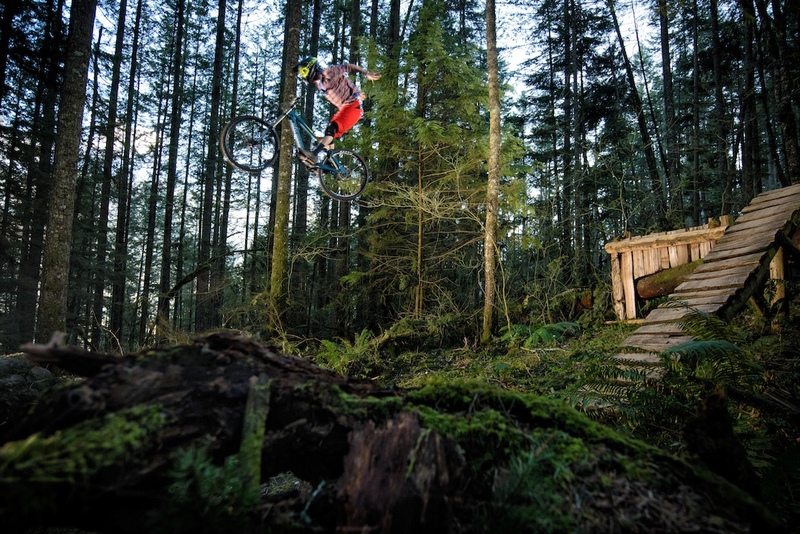 And speaking of jumping, the Maiden could be the most predictable and one of the best flying downhill bike out there. Not only is the Rocky surprisingly easy to get off the ground relative to its 200mm of travel, but it also flies in such a steady, neutral, and easy going fashion that it’s likely to turn even the most fearful jumper into a fearless park rat who trades in their cross-country bike for a lift pass. The Maiden and you could be a marriage made in heaven if you spend more time in the bike park than you do at home. The tradeoff for all that Bilzerian-like eagerness to party is that the Maiden just doesn’t feel like a true downhill race bike. It doesn’t have that stick-ability on extremely rough and fast tracks like the V10 or Commencal, and because of that, it’s not quite as eager to hold a line in those situations. The Maiden is a downhill sled, so it can obviously smash a corner with ease, and it can probably be taken through a set of tight berms faster than other downhill bikes, but it’s a different story when the corner is full of roots, rocks, or braking bumps rather than a skill-equalizing berm that makes everyone feel like a hero. 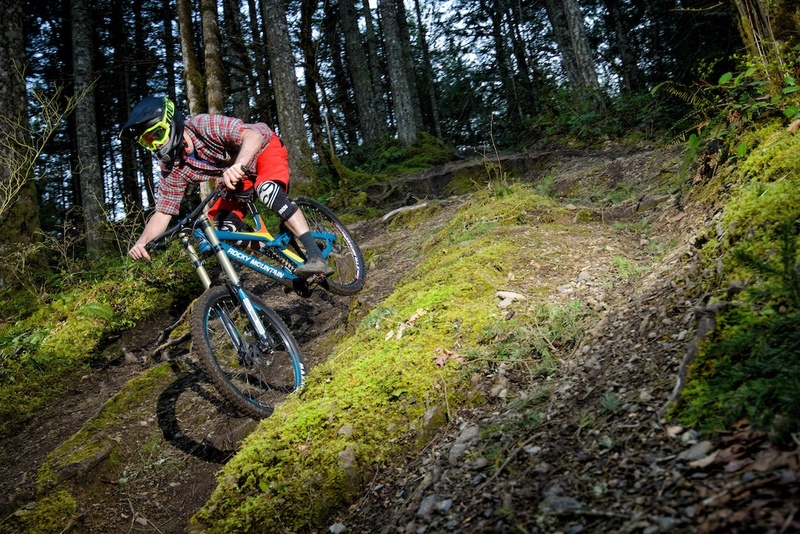 There are faster downhill bikes, but not many that are as fun as the Maiden. So, how does the Maiden compare to other bikes in the same class? 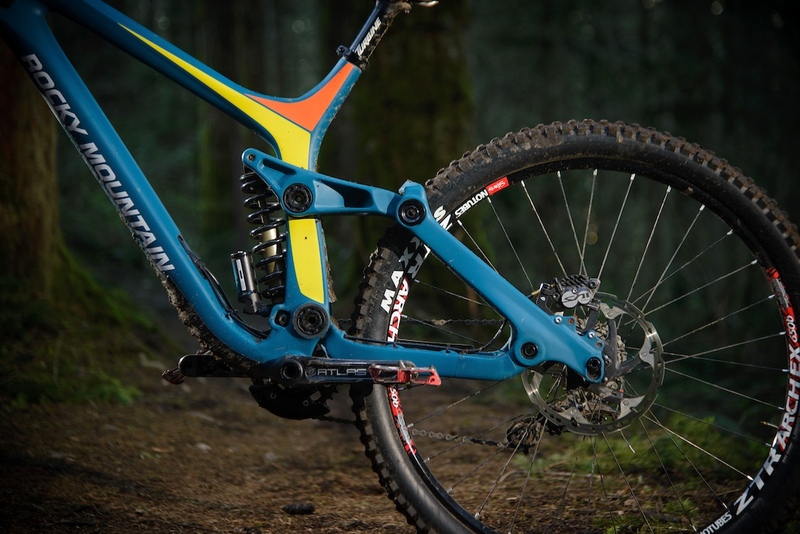 The Maiden’s suspension, along with its handling, make it very different to bikes like Santa Cruz’s V10, the GT Fury, or the new Commencal. Those are machines that, while obviously capable in any manner, do seem to only want to go as fast as possible, regardless of what’s between them and the bottom of the mountain. They’d prefer to stay low and go fast, whereas the Maiden very obviously likes to log a good amount of time in the air during its way down the mountain. 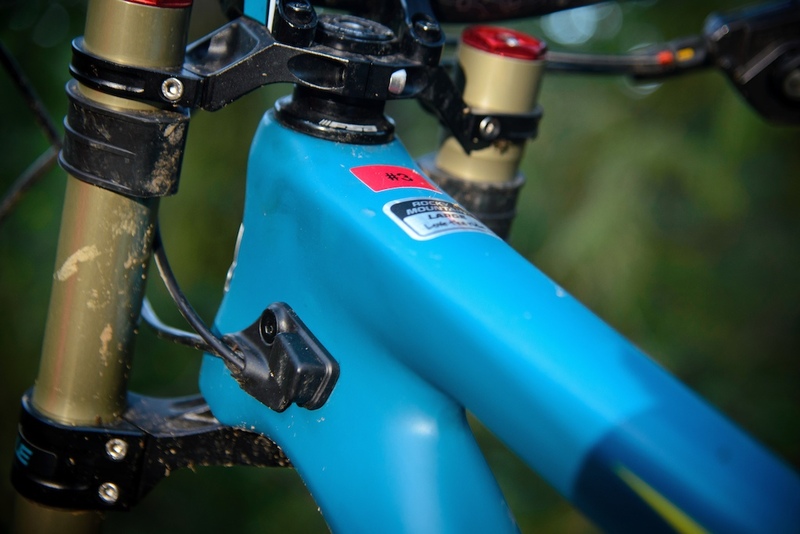 The 200mm-travel Rocky does feel like less of a pure DH race bike because of this, which isn’t a surprise given how that was Rocky’s intentions with the Maiden. And while this doesn’t mean that the Maiden is any better or worse than those more race-focused machines, it most certainly does mean that it’s different. 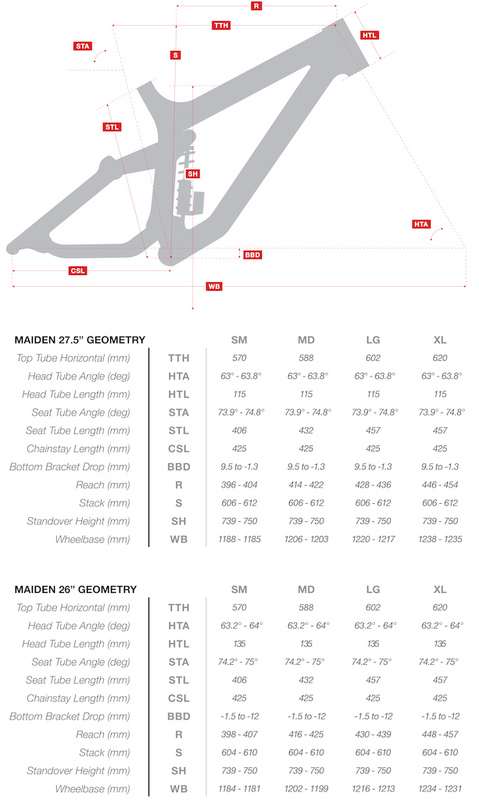 While the Maiden probably isn’t the ideal choice for someone who takes their racing serious enough to train and travel for it, it’s still a capable rig. Do you buy a race license every season? Then I’m not convinced that this bike is for you. However, the Maiden and you could be a marriage made in heaven if you spend more time in the bike park than you do at home, or if your weekends are all about sessioning booters and doing your best two-wheeled Ken Block impressions. 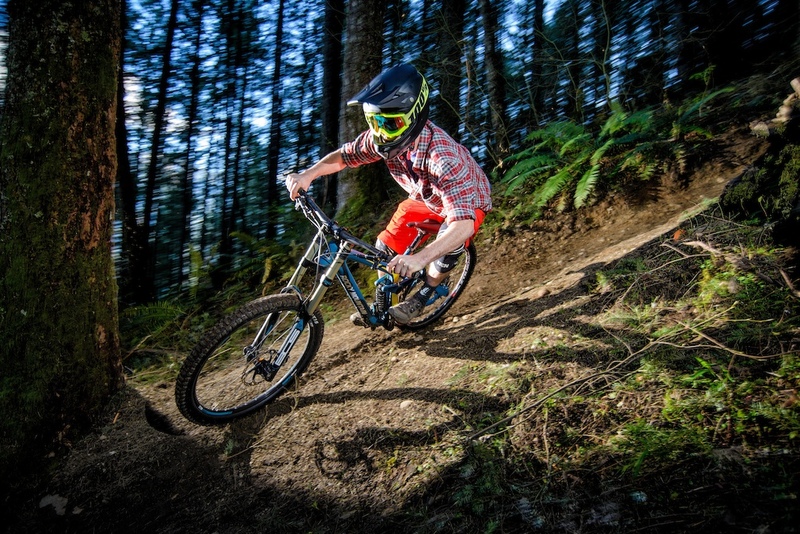 It may be agile and playful for a downhill bike, but that comes at the expense pure speed and stability compared to more race-focused rigs. To a lot of riders, especially those in North America, getting to spend time on a BOS fork and shock is akin to saddling up on an albino crocodile – it’s exotic, rare, and everyone is going to notice it. Is it the Sunn and Nico Vouilloz connection? The rally racing history? Either way, there’s something about this Toulouse-made suspension that makes you think you’re going to go faster if you have it on your bike. But while BOS suspension might be out of the ordinary to many, setting it up and making adjustments certainly won’t be. 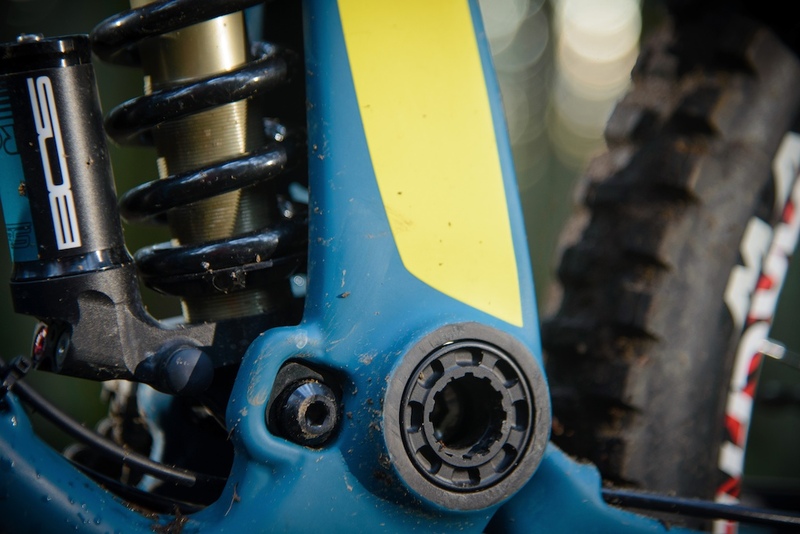 The BOS Idylle fork is air-sprung, and it allows riders to tinker with low-speed rebound, and both low- and high-speed compression via three external dials, which are all common adjustments that most people are familiar with. The latter two damper adjustments felt like they provided quite a narrow tuning range, especially the low-speed compression, and the fork required a bit firmer of a spring-rate than would have been ideal to keep it up in its stroke. This meant that it sacrificed a touch of initial bump sensitivity in favor of some increased support. The low-speed rebound dial also ended up being backed out a bit more than expected, with the Idylle seeming to track the ground better at a slightly quicker return speed than a BoXXer or Fox 40 would prefer. Much like the fork, the Maiden seemed to really like a slightly quicker rebound speed out back, further enforcing the bike’s preference for popping up over top of things rather than plowing straight through them as so many other downhill sleds seem to respond best to. A slower rebound setting only took away from this, but without adding to the Maiden’s stability or willingness to track over rough ground, and it’s better to amplify a bike’s best qualities rather than try to turn it into something that it isn’t.